Who should not take Tegretol XR? What conditions does Tegretol XR treat? Tell your doctor right away if you have any serious side effects, including: headaches that are severe or don't go away, signs of liver problems (such as nausea/vomiting that doesn't stop, loss of appetite, stomach/abdominal pain, yellowing eyes/skin, dark urine), signs of kidney problems (such as change in the amount of urine), mouth sores, fainting, fast/slow/irregular heartbeat, unusual eye movements (nystagmus), vision changes (such as blurred vision), joint pain, swelling of the ankles/feet, pain/redness/swelling of the arms or legs, numbness/tingling of the hands/feet, signs of low levels of sodium in the blood (such as severe drowsiness, mental/mood changes including confusion, seizures). List Tegretol XR side effects by likelihood and severity. Before using this medication, tell your doctor or pharmacist your medical history, especially of: decreased bone marrow function (bone marrow depression), blood disorders (such as porphyria, anemia), glaucoma, heart disease (such as coronary artery disease, heart failure, irregular heartbeat), kidney disease, liver disease, mental/mood disorders (such as depression), mineral imbalances (such as low levels of sodium or calcium in the blood). What should I know regarding pregnancy, nursing and administering Tegretol XR to children or the elderly? Some products that may interact with this drug are: certain azole antifungals (isavuconazonium, voriconazole), orlistat. Carbamazepine can speed up the removal of other drugs from your body, which may affect how they work. Examples of affected drugs include artemether/lumefantrine, boceprevir, certain calcium channel blockers (such as nifedipine, nimodipine), nefazodone, HIV NNRTIs (such as delavirdine, efavirenz, etravirine, rilpivirine), praziquantel, ranolazine, among others. Does Tegretol XR interact with other medications? Should I avoid certain foods while taking Tegretol XR? 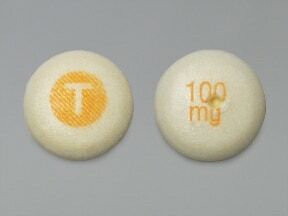 This medicine is a yellow, round, coated, tablet imprinted with "T" and "100 mg". 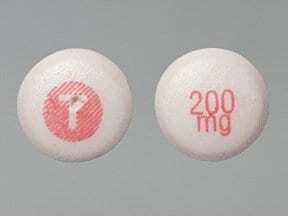 This medicine is a pink, round, coated, tablet imprinted with "T" and "200 mg". 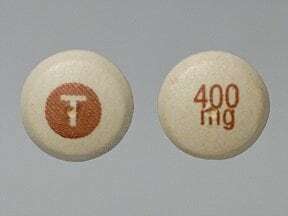 This medicine is a brown, round, coated, tablet imprinted with "T" and "400 mg". Are you taking Tegretol XR? Are you considering switching to Tegretol XR? How long have you been taking Tegretol XR?